Finding a place to set your keys and watch where they won't get lost seems next to impossible! With this little valet tray you won't need to worry about losing these ever again. It works great for rings, watches, and especially keys (not big enough for phone and wallet)! 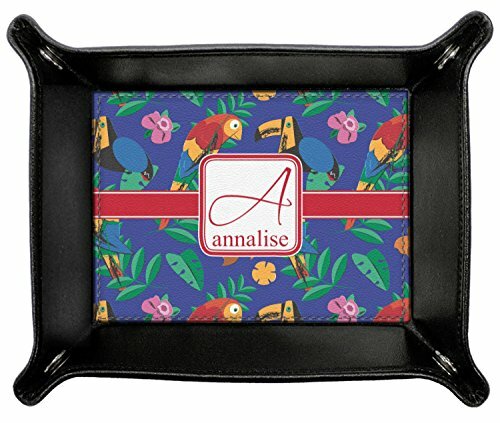 These handy valet trays are a great size for small accessories and measures at approximately 7" x 6" x 1.25". They are made of a gorgeous genuine black leather with your personalization on the bottom piece of leather. The tray keeps its form by snapping with button snaps at each of the four corners. This is the perfect thing to keep right next to your front door or by your bedside table. This tray is easily customizable in our design center. Pick a pattern or background to suit your personality or upload your own picture or artwork. Choose a fun quote or write your own text for an inspirational daily reminder. We are happy to assist if you need any help! Have fun designing! Looking for more men's accessories? Take a look at our genuine leather men's wallet, messenger bags, and our travel dopp kit. We even have a whole leatherette section that is worth exploring! What's more classic Hawaiian than rainbow-colored parrots, toucans, and flirty flowers? This bright design will send you straight back to better days, spent lounging on a beach in some tropical paradise. Customize the label with your name and initial for the last touch.